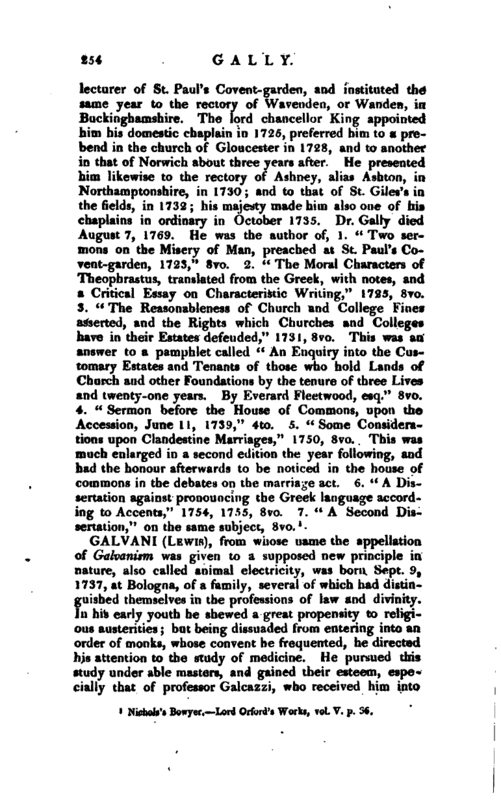 , from whose name the appellation of Galvanism was given to a supposed new principle in nature, also called animal electricity, was born Sept. 9, 1737, at Bologna, of a family, several of which had distinguished themselves in the professions of law and divinity. In his early youth he shewed a great propensity to religious austerities; but being dissuaded from entering into an order of monks, whose convent he frequented, he directed his attention to the study of medicine. He pursued this study under able masters, and gained their esteem, especially that of professor Galcazzi, who received him into | his house, and gave him his daughter in marriage. To this union his success in life is in a great measure to be ascribed. In 1762, after having sustained an inaugural thesis, “De Ossibus,” he was appointed public lecturer in the university of Bologna, and reader in anatomy to the institute in that city, chiefly by the interest of his wife’s relations. By the excellence of his method of teaching he obtained crowded audiences, and by his researches and experiments in physiology and comparative anatomy he established a high reputation throughout the schools of Italy. A singular accident is said to have given birth to the discovery which has immortalized his name. 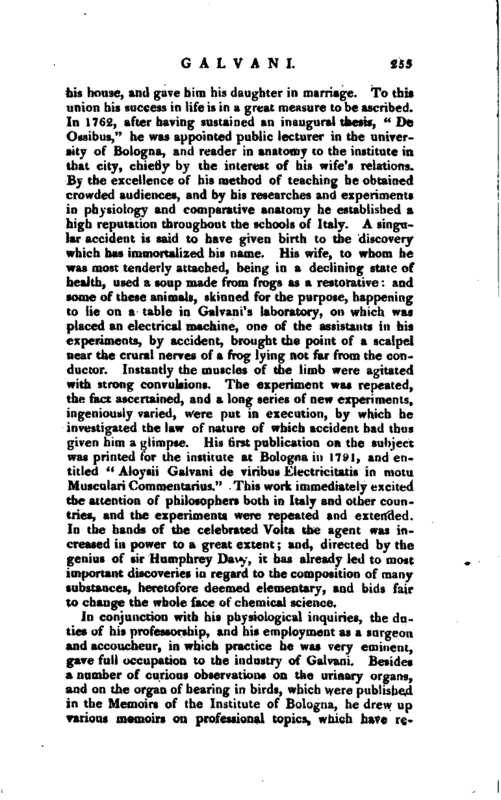 His wife, to whom he was most tenderly attached, being in a declining state of health, used a soup made from frogs as a restorative: and some of these animals, skinned for the purpose, happening to lie on a table in Galvani’s laboratory, on which was placed an electrical machine, one of the assistants in his experiments, by accident, brought the point of a scalpel near the crural nerves of a frog lying not far from the conductor. Instantly the muscles of the limb were agitated with strong convulsions. The experiment was repeated, the fact ascertained, and a long series of new experiments, ingeniously varied, were put in execution, by which he investigated the law of nature of which accident had thus given him a glimpse. His first publication on the subject was printed for the institute at Bologna in 1791, and entitled “Aloysii Galvani de viribus Electricitatis in motu Musculari Commentarius.” This work immediately excited the attention of philosophers both in Italy and other countries, and the experiments were repeated and extended. 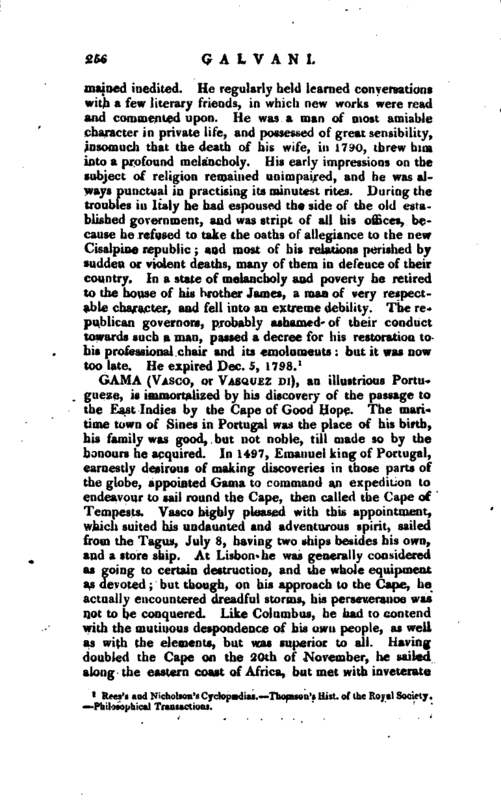 In the hands of the celebrated Volta the agent was increased in power to a great extent; and, directed by the genius of sir Humphrey Davy, it has already led to most important discoveries in regard to the composition of many substances, heretofore deemed elementary, and bids fair to change the whole face of chemical science. Rees’s and Nicholson’s Cyclopædias. Thomson’s Hist, of the Royal Society. Philosophical Transactions.